It is always good to haver perspective. 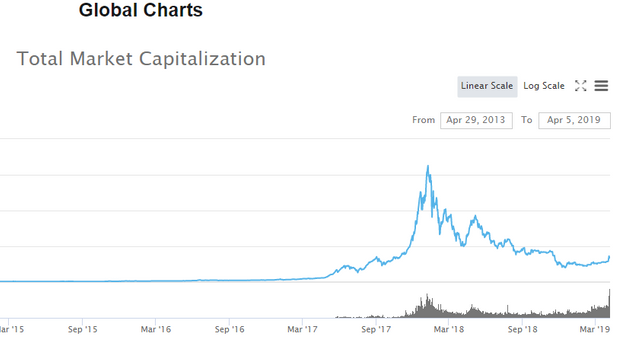 When it comes to BTC I like to zoom out and look at the long term chart. Here is how I draw this. First off I notice that this is quite a nice chart. The next thing I see is that we may have seen the bottom but that is not quite that certain. In fact I can imagine that the log trend that I drew is in fact even a bit slower. Then I notice the spike we saw in the last few days and I notice that this could be a little bit similar to what we saw in the last bear market where a massive pump sorta ended it. The volume in the last few days was significant. But not significant enough that I am positive we are out of the woods just yet. We need more continuation of this buying volume before we can be certain that the bottom is in. What is however always clear is that i simply don't have enough btc. This I fully agree with. I'm seriously impressed with how much the DAPP ecosystem has grown on STEEM. @dlike will start its own IEO in a few days and I love how the games are progressing. The most important thing for me is the setting up of passive income. It has taken my time off of writing content. But on the long run the financial security is important. The best part is that I'gained most of these tokens through voting, delegation, resteems and writing content about projects. I didn't even buy the tokens. BTC gains have slowed down a little. But in terms of total crypto marketcap, I can see a potential Cup & Handle forming up. this is very risky. I guess it depends on how bad would it be for you to default on your loans. If I were bankrupt, I would go for it. But since I have a nice amount of property, risking this for a speculative gain is not worth it. The log-trend looks almost too good to be true. I would not be surprised to break it. Any such move must eventually end, usually when the market reaches saturation. I think that recent developments suggest that we can continue to grow logarithmically for a few more years though. You just got a 3.9% upvote from SteemPlus!